Who says Instagram is only for photos taken on land? Why not really make your friends and followers’ jaws drop with some underwater photos? Whether you scuba or snorkel Gili Trawangan and the other Gili Islands are the ideal locations for some pretty amazing photo shoots, get your waterproof camera gear ready and get wet! 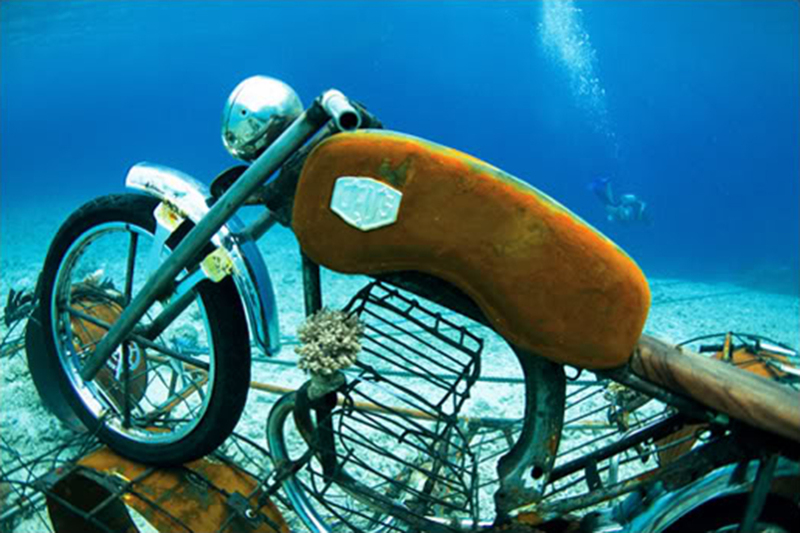 Best known for their customized motorbikes, you’ll be pretty surprised to find a Deus Ex Machina bike 50 metres off the shores of Gili Trawangan. This was a collaboration with The Marine Foundation which is a bio-rock sculpture that is actually to help with the growth of new coral and make new reef for marine life. As it’s so close to the shore and at only about 6 metres deep, it’s best to snorkel this site. There are some pretty amazing poses on this bike, so get creative to get the best shot possible. Along the same lines of the Deus bike, there are also a couple of sunken Vespa scooters. Swim out and you can snorkel, or freedive to your underwater ride for some great photos. There are also some other pieces of bio-rock here to promote reef regrowth. The scooters are only about 3 metres down so easy to get to and spend some time getting the perfect shot. British sculptor Jason deCaires Taylor created NEST an underwater sculpture park, which is still in progress. This is an incredible piece of work with 48 human figures in a circle that is said to represent the connection between humans and nature. 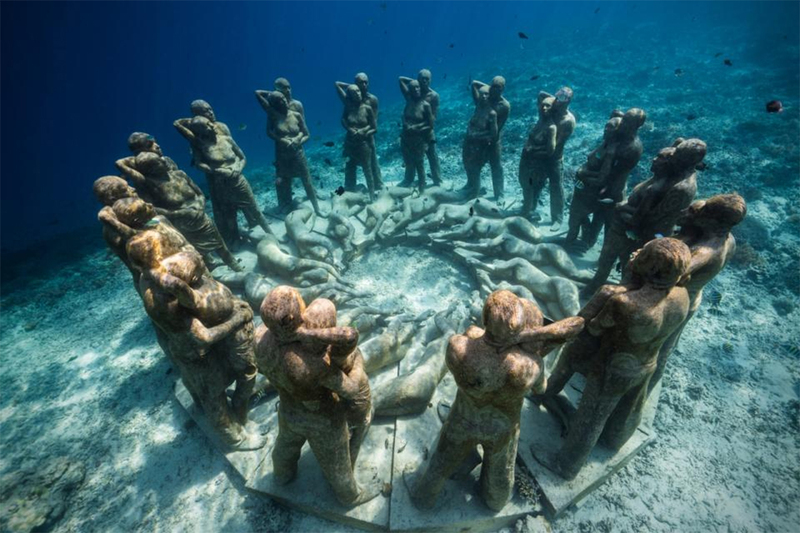 Taylor also has underwater sculptures in other parts of the world. 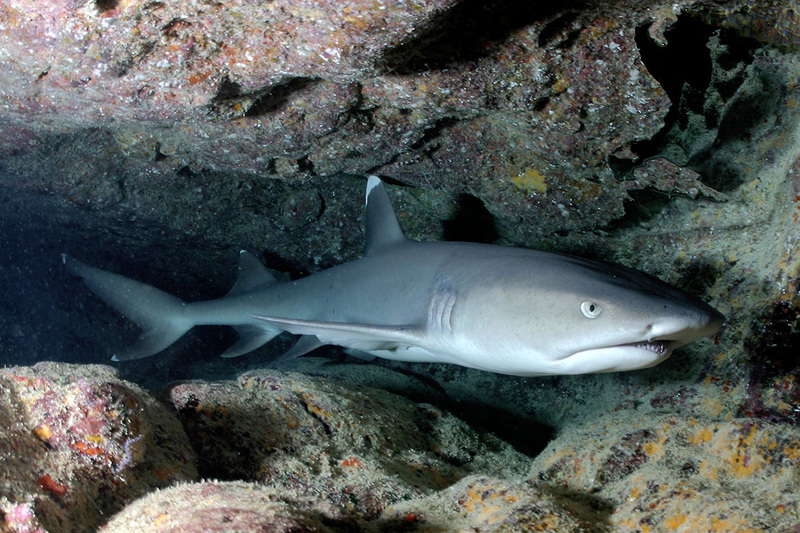 This one is only 3 metres below the surface so is easily accessible for snorkelers and divers. It makes for some pretty haunting photos, so don’t miss this site. The waters directly in front of Villa Almarik are well known as the best sea turtle spot on Gili Trawangan. Swim or snorkel out from the beach and you are almost guaranteed to be floating along with some of these magical creatures. The sheer size and grace of these turtles is breathtaking. You shouldn’t get too that you disturb them, but you can still get some incredible photos for your gram. Want to show your brave side on your Insta feed? How about a trip to shark point with Gangga Divers? This is an easy dive site very close to Gili Trawangan where you are very likely to get up close and personal with reef sharks. They like to rest in the valleys at around 15 metres so you’ll need to be a diver, but it’s a great beginner site. Do you love to find unique places to photograph? You can’t get much more unique than these underwater spots around Gili Trawangan. 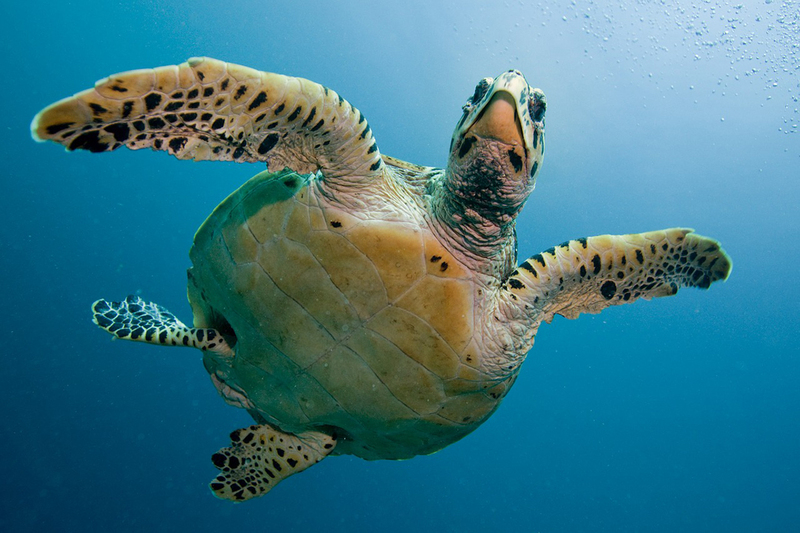 Which would be your first stop on an underwater photography tour of the Gilis? We’d love to hear your opinion in the comments below.